^ Chappel, Mike. Indianapolis Colts: Team Will Turn to Single-Game Tickets in Chase for Sellouts. The Indianapolis Star. August 1, 2012 [September 6, 2012]. ^ 4.0 4.1 4.2 Facts and Information. 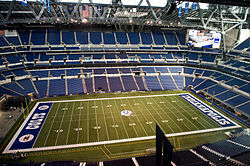 Lucas Oil Stadium. 2008 [January 10, 2012]. （原始内容存档于2012年1月14日）. ^ Lucas Oil Stadium. Emporis. [January 10, 2012]. ^ Super Bowl XLVI / Lucas Oil Stadium. ArchDaily. [2012-10-19]. ^ INDIANAPOLIS INTERNATIONAL AIRPORT RECEIVES THE 2009 MONUMENTAL AWARD. Kibi.org. 2009-11-19 [2012-10-19]. （原始内容存档于2010-01-14）. ^ BTN Dials Up Title Coverage Friday in Indianapolis. Big Ten Network. December 1, 2011 [January 10, 2012]. ^ Iscba Announces Lucas Oil Stadium Grand Opening Events (新闻稿). ISCBA. June 23, 2008 [January 10, 2012]. （原始内容存档于2012年6月18日）.